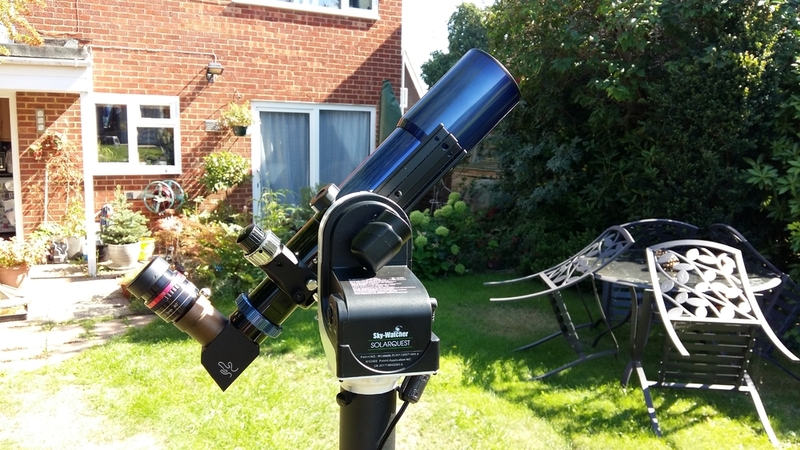 Yesterday I collected a new to me Skywatcher SolarQuest Mount, and as not a lot has been written about this relatively new mount, I thought that I'd give an account of my experience with it. The mount is very compact and the supplied tripod and pier extension make for a lightweight setup. 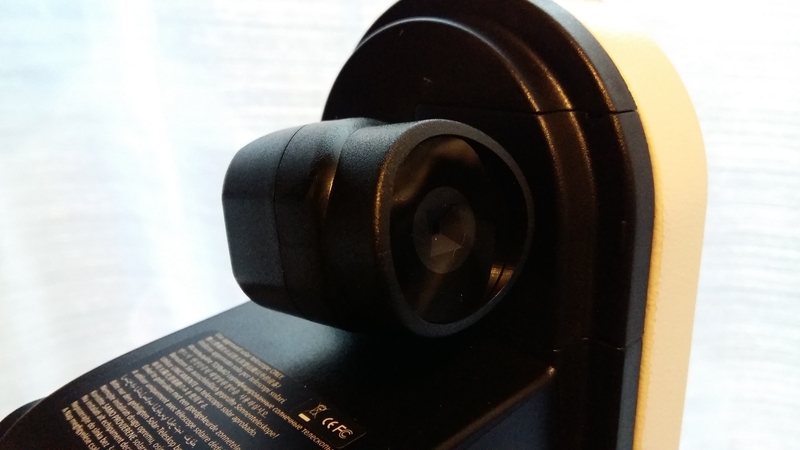 The tripod and pier extension is the same as supplied with the AZ GTi, but as has been stated by others the tripod is slightly on the flimsy side and I find it rather prone to vibrations, taking over 5 seconds for vibrations to dampen down when tapped. I've been intreagued by this mount since it was first announced, not really believing the marketing hype. However, operating the mount is simplicity itself and it really is as simple as 1, 2, 3. The altitude axis cannot be disengaged and is therefore not adjustable so you'll need to mark your dovetail with the balance point for the setup in use to ensure that the Alt axis is balanced as well as it can be. After levelling the tripod and attaching the OTA, all that is left to do is to turn on the mount. The mount sits stationary for a while whilst it gets a GPS fix then raises the OTA to approximately the correct altitude and then starts slewing around the azimuth axis until it finds the sun. It then stops and after a short period of nudging all goes quiet and the sun is centred within the FOV, which is where it stays. The first time you use the mount, you need to use the 8-way sliding switch to centre the sun in the FOV to apply a correction and if you press the power button twice after doing this then the offset is stored and applied every time the mount is switched on. When I initially tried to centre the sun, I thought that the 8-way switch was broken, but it was not the default slew rate is very slow (16x), and eventually the sun moved to the centre of the FOV. 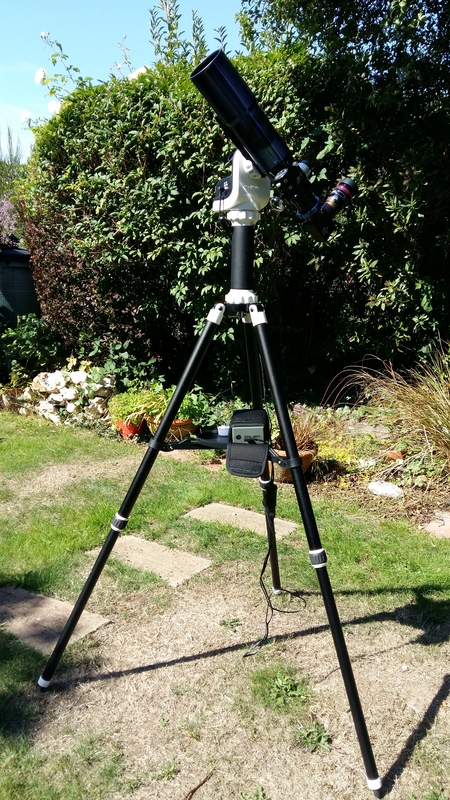 I set the mount up and left it running all afternoon with my ZS66 and Lunt Herschel Wedge and I'm pleased to report that the sun remained dead centre for at least five hours, which is impressive. Under clear skies this afternoon the mount had found the sun, locked on to it and was tracking within approximately 60 seconds. When I collected the mount yesterday it was cloudy with a brighter patch of cloud where the sun was and the mount managed to point in the right general direction under those conditions. I'm not sure how patchy cloud will affect the tracking accuracy, but will give it a test the first opportunity I get. The mount is powered by 8x AA batteries or via a 12v power supply. Unlike the AZ GTi there is no power socket integrated into the mount. 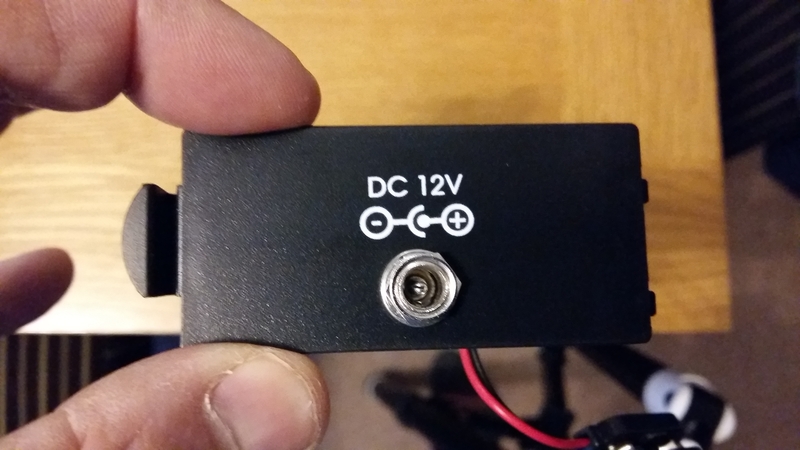 To use a power supply you need to remove the battery cover and battery cassette and attach a different battery cover which has a 12v power socket built in. 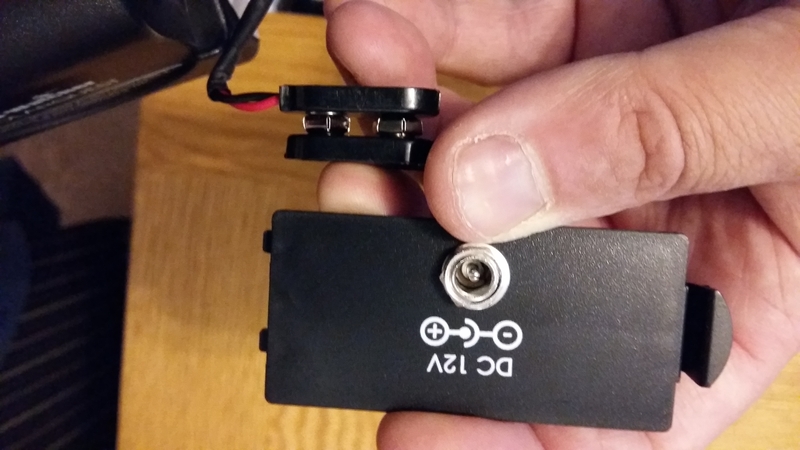 The 12v socket connects to the PP3 battery connector inside the mount the same way that the battery cassette does. There isn't a lot more to say about the mount really, it does exactly what is says on the tin and does it very well indeed. I've been very impressed with the package and am looking forward to using this mount lots more, but the mount will benefit significantly from being connected to a more sturdy tripod the same way that the AZ GTi does. I hope that this brief introduction proves to be of use and I'll add some photos tomorrow. This is what I'm hoping, though somewhere in my research about this mount I'm sure that I read a statement from Skywatcher stating that cloudy conditions would reduce the pointing accuracy of the mount, though for the life of me I can't remember where. Would that be referring to the effect you noted on the previous day, pointing in the "right general direction" rather than being spot-on? Sounds like a great mount. I’m sure it will just maintain solar tracking until it relocates the sun. My only issue with it is its single purpose. I can’t justify having one mount just for the sun so being able to upgrade the AZGTi with similar functionality would be excellent. What is it’s weight capacity? Would a Lunt 60 pressure tuned be heavy? Manufacturers spec states a maximum payload of 4kg, the same as the AZ GTi. The AZ GTi handles my ED100, 2" diagonal and Baader Zoom when its attached to a Berlebach Uni 18 and Skywatcher EQ5 pier extension, but its right on the limit with my Starwave 102 f/11 due to the much longer focal length. As its essentially the same base as the AZ Gti but with different internals, I'm guessing that the same will be true for the SolarQuest. Thats very true Stu, and I've agonised over getting one since it was first released. I decided that I couldn't justify the cost new for a single purpose mount but that I would pick one up if one turned up used, which it did. Even then I agonised over it for a couple of weeks before taking the plunge. My issue is that I'm a very lazy solar astronomer and like many people don't get as much time as I'd like to observe due to a combination of pressures from work and home. I don't often have the time to set the AZ GTi up and get it aligned correctly, often setting up to grab the sun before it disappears behind the trees at the end of the garden after work, during a 30 min lunch break when I also have to grab something to eat or in between a list of jobs that needs to be done at the weekend, so in the end I decided to pay for the convenience. However, like @Grant I am very pleased with the mount and it will prove very effective for outreach events as when the inevitable happens and the mount gets knocked, all it takes is a quick power off then on again and the mount has re-located the sun, locked on and is tracking within about 60 seconds. Thinking about extra functionality, I was thinking that the ability to add a Lunar mode to this mount would be a good option as I would think that even with a partial moon that the mount should be able to pick it up easily enough, though as there is no option for a handset I guess that it would have to do an auto switchover based on the time via GPS. 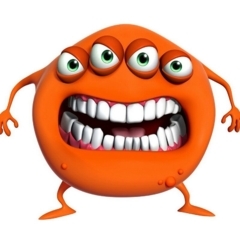 @AdeKing put like that it does make a lot of sense. I often set a scope up tracking the sun whilst working around the house or garden and pop to have a look every now and then. This sounds ideal for that kind of observing. Just to add my own experience to the thread - I too was sceptical of the Ad claims for the Solarquest, but as others have found, it does exactly what it says on the tin and does it very, very well. Someone has mentioned giving the AZ-GTi the same capability: I can't see that ever happening because the photo-sensor unit of the SQ is housed where the clutch mech is located on the GTi. In terms of payload - my understanding was that the AZ-GTi was 5Kg and the SQ 4Kg, but I could be wrong - the wife often says that I am. It'll certainly take an ED80 DS Pro, Lunt Wedge and Baader Hyperion with no effort. I meant exactly like that - as you have illustrated admirably, the Solarquest has something of the AZ-GTi in it's genes! 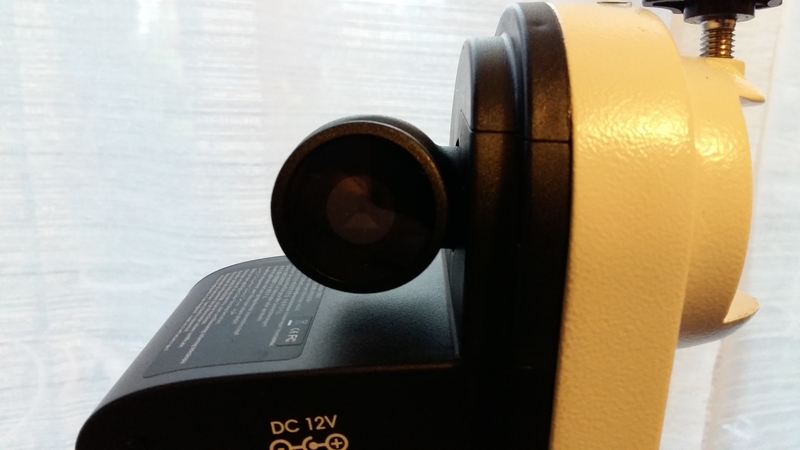 Makes an excellent platform for mounting a camera with a solar-filtered lens. Ideal for transits and eclipses.